First review of the year, guys. I hereby promise you I chose a good one. In fact, I really feel as though I have exercised great restraint in waiting this long to review it. Due out in just under two weeks now, I decided I could wait no longer. It's not that I haven't made my feelings about Liza Palmer's books abundantly clear, because I know that I have. 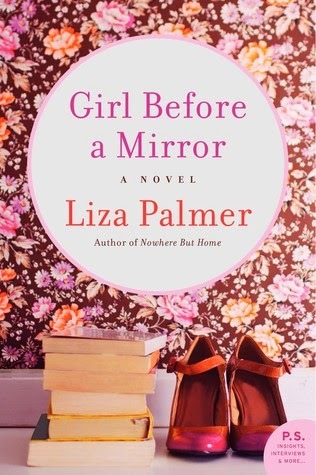 It's that her latest novel—Girl Before a Mirror—is so good it's giving her others a run for their money as my favorite (and I honestly didn't think my love for Nowhere But Home could be surpassed). So good I've already reread it once and am fending off a second reread even as I type this. There are other books out there, and they all deserve a chance. I know this, and I feel their call keenly. But. I had supreme difficulty letting go of this one, and I can see myself diving back in regularly and indefinitely just to spend time with these characters again and to experience Anna's hilarious and thoughtful journey along with her once more. It was just as good the second time around, and I know it will only wear better with time. Anna Wyatt finds herself in the unenviable position of not having a clue what to wish for as she blows out the candle on her 40th birthday. Surrounded by her friends, their spouses, and her beloved (if beleaguered) younger brother Ferdie, Anna feels affectionate but a bit blank. A year into a self-imposed dating sabbatical, she's been taking stock of her life and cleaning house of anything (or anyone) extraneous. The result is she finds herself in an undeniably clean, but somewhat sterile place, in need of inspiration and not sure where to look. Hoping to advance at the ad agency where she works, she tracks down Lumineux Shower Gel—a dying product in need of revival. Saddled with hopeful newbie graphic designer/sidekick Sasha, Anna finds inspiration in the unlikely form of Sasha's well-read copy of bestselling romance novelist Helen Brubaker's new self-help book Be the Heroine, Find Your Hero. And before they know it, Anna and Sasha are on their way to Arizona and the annual RomanceCon. Pairing up with the con and Ms. Brubaker herself, Anna and Sasha wind up judging the Mr. RomanceCon competition, with the winner slated to be the new spokesman for Lumineux Shower Gel. Determined to seal the deal and make it out of Romance Land alive, Anna is in no way prepared for the exuberance of the convention, the viciousness of the Arizona heat, and the charming Britishness of one Mr. Lincoln Mallory with his blue oxford cloth shirts and his steady gaze. "This is Lincoln Mallory." Vomit. "Hey, hi. It's Anna. Anna Wyatt from the other night. From the . . . um . . . from the elevator? And the apple . . . breakfast time—"
"I'm going to stop you there, love. I know who you are even without the reminder of apple breakfast time," he says. His voice is even better than I remember it. "I apologize for my late call," I say, still not having taken a breath now going on nine minutes. "I assumed you were busy at your Booty Ball." Lincoln Mallory saying booty will go down in history as one of my favorite things in the world. "You still hungry?" I ask. "I've already eaten, but I did manage to get something for dessert." "It's a surprise," he says. My face flushes. "When your Booty Ball ran long—a sentence I never thought I'd say, quite frankly—I had to strike out on the field trip on my own." "So you're holding this dessert hostage." "You make it sound so devious." I scan the lobby. The hotel bar. The kiss. I close my eyes. "I do like a woman with her priorities in order." Silence. "Anna?" "I didn't know if you'd hung up," I say. "Sure. Okay," I say. Silence. "Hello?" "It's never not funny, is it?" "I mean . . . ," I say, unable to keep from laughing. I shut the car off and take a second, the blistering heat sitting on the top of my head like I'm under a heat lamp. I am walking toward the meet and greet when the phone rings. "Anna Wyatt," I say, knowing exactly who it is without even looking at the screen. "This is my formal apology," Lincoln says. "Go ahead then," I say. "I'm sorry." I like that Lincoln doesn't elaborate or get lost in a maze of buts and excuses for why what he did was actually okay. A simple I'm sorry is the most beautiful thing in the world. It's these simple, thoughtful moments that make me pause as I'm reading to mark their effect (and possibly read them aloud to the nearest warm body so that I'm not alone in my wonder). Girl Before a Mirror is filled with them. I've decided the only way to start a new year is with an instant and permanent resident on my beloved bookshelf. Done and done. Girl Before a Mirror is due out January 27th. Love is Not a Triangle - "I'm not sure I can even articulate how amazing and affirming this book was for me." one of the things i admire most about your reviews is your ability to beautifully articulate what it is about the book that captured your heart and refused to let go. you make me feel as if i love these characters too, even though they are but strangers to me. well, not strangers for much longer because i'll soon have it in my possession (which i knew would be the outcome before i even started reading). Ok - you've sold me on this book. :) I've been wondering which book to make my second Liza Palmer. I really loved Nowhere But Home so I have never been able to decide which one was next. Great review. Soon, yes! I can't wait to hear what you think, Carla. I *need* to talk about these people. Thanks, Rowena. Happy 2015 to you, too! I hope you enjoy this one, and each of her others. They are all worth your time. Huzzah! This is the one, Misti. This is definitely the one. AHHHH! I CAN'T WAIT! Love Liza Palmer's writing. Let's see if like you, I would love this just as much as Nowhere But Home. Fingers crossed, Chachic! Fingers. Crossed. It is utterly fantastic. And every bit of the con is perfect. This is easily the third--or fourth?--time I've read this particular review of yours and it only gets better upon re-read. I'm in love with GIRL BEFORE A MIRROR and I haven't even read it yet. I adore Liza Palmer and was so looking forward to diving into it today but, alas, Juno has not only buried me under two feet of snow, but it has also rendered this beloved novel delayed in reaching me. *sigh* I will curl up with this soon, I hope, as long as my professors take pity on me and don't assign too much work this weekend. I desperately want to meet these characters and, as always, the excerpts you select are so, so perfect. Lovely review, Angie--all of yours are beautifully written but this is, by far, my favorite. Keertana, thank you for such a lovely compliment. You've made my day. I hope you've managed to track down a copy. I got my finished copy not long ago and the silver foil circle is such a visual pleasure.